“Rogue One” is the slam-bang prologue to the first “Star Wars” movie, ending moments before “A New Hope” begins. 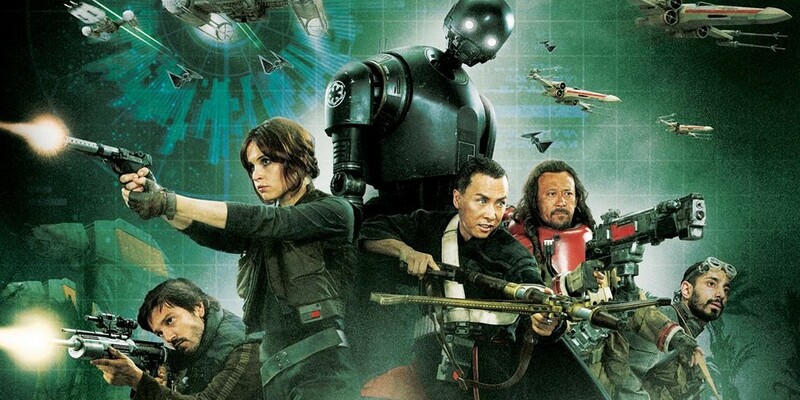 If you were binge-watching “Star Wars,” “Rogue One” would be the first episode. The story, such as it is, revolves around the Rebel Alliance’s attempt to capture the plans for the Death Star that will show its fatal flaw. Key to this effort is Jyn Erso, played by Felicity Jones. Jyn’s father, Gal en Erso, was conscripted by the Empire to design the Death Star; his revenge is putting in the back door that eventually allows the Alliance to blow it up. Of course, Jyn and the rebel sharpshooter Cassian Andor (played by Diego Luna) have to battle their way across several planets or star systems (if you have hyperspace drive, what’s the difference?) before fetching up on the planet that holds the Empire’s database. The derring-do involved in finding the correct files and transmitting them to the rebels will remind computer users of a certain age of the old days of dial-up. The film is an entertaining mash-up of Star Wars motifs plus samurai movies (the producers somehow restrain themselves from naming the blind warrior armed only with a staff something like “Zatoichi”) with quite a lot of Wild West and Power Rangers, about what you would expect from a Star Wars crew with an unlimited budget from Disney. Bits of the earlier movies are inserted seamlessly into this one, and even characters are revived via the miracle of CGI. The film won’t launch any acting careers, but if it makes money, it may well spawn a new generation of Star Wars spinoff movies.